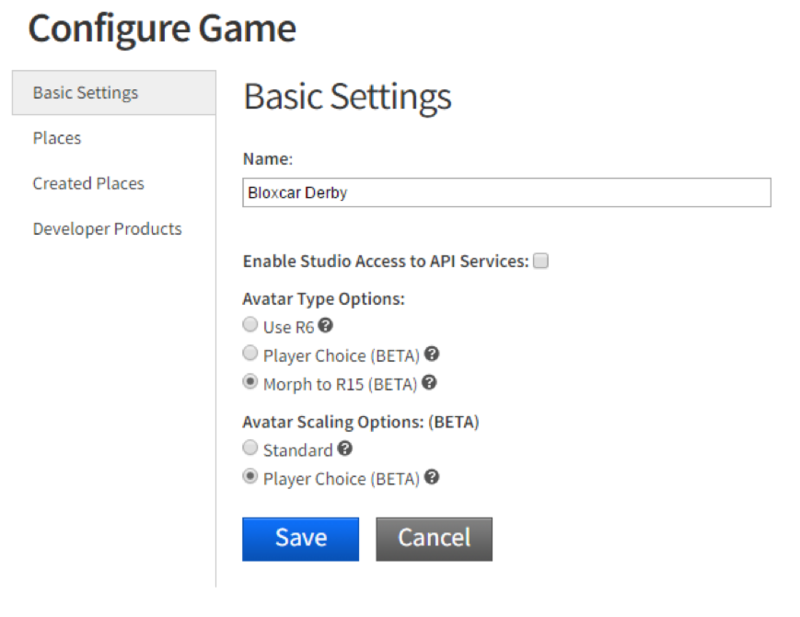 Today we have released our newest avatar customizing feature – the ability to scale avatar size in your profile, games, and Roblox Studio. This is the newest milestone in our ongoing mission to help you personalize your avatar. To customize your character size, click “Avatar” in the Roblox website’s sidebar to go to the Avatar Customizer. You have to be R15 to change your scale, so make sure that your Avatar Type is set to R15. Below the Avatar Type is a section titled “Scaling” with a sliding scale for Height and Width. Move the scales up or down to create a unique character build for your avatar! Your avatar can have a height between 95% and 105% of the standard height, and a width between 75% and 100% of the standard width. The scale that you choose will appear in your avatar image, as well as in any game that supports R15 avatars and allows scaling. Note: Most packages only work with R6 at the moment, so if you switch to R15 your character will appear blocky. We are currently in the process of updating all existing packages to work with R15. In the “Basic Settings” tab, you will see two sections labeled “Avatar Type Options” and “Avatar Scaling Options.” To allow players to use the scale that they have set, set “Avatar Type Options” to R15 and “Avatar Scaling Options” to “Player Choice.” Games that allow R15 avatars default to the “Player Choice” setting. Games offer even more size customization in Roblox Studio! Developers now have access to four new NumberValue objects in the humanoid of R15 characters: BodyDepthScale, BodyHeightScale, BodyWidthScale, and HeadScale. Changing these values will scale the character by multiplying the original size by the current value for that dimension. The body parts of the humanoid will be scaled in all three dimensions while the HeadScale will scale the head uniformly. When using scripts in your game, you aren’t restricted to the Avatar Customizer page’s scale limits. Try it out by visiting this place HERE! We hope you enjoy customizing your character build! Stay tuned for more updates on R15 Character Scaling.